From left: Calvin Johnson, dean of Auburn University College of Veterinary Medicine, Jay Price, Barron Lakeman, and Chase Whitworth. 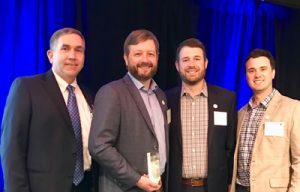 Southern Veterinary Partners (SVP), a veterinarian owned and operated a regional network of animal hospitals in the South, has been named an Auburn University’s “Top Tiger,” which recognizes the fastest-growing companies led by Auburn University alumni. Jay Price, DVM, CEO; Jeff Falone, DVM, chief medical officer; and Chase Whitworth, DVM, regional medical director, all graduates of Auburn University College of Veterinary Medicine, and Barron Lakeman, chief development officer and graduate of Auburn University, received this honor. Based in Birmingham, Ala., SVP is the largest veterinary management company based in the South. It provides centralized support for its in-network animal hospitals, including marketing, HR, finance, inventory, and purchasing management, and provides enhanced benefits to team members. The hospitals retain their names, culture, and local commitment to their communities as well as veterinarians and staff. SVP’s network includes 57 animal hospitals across 10 southern states.